Barns are a very welcome commodity to have if you own or operate a farm in the Perth suburbs or anywhere else. They are great for storing hay, supplies and any kind of heavy machinery often used in agriculture. Because of this, practically every farm in the Perth area has one or more of these sheds. While the functionality of a barn is the same wherever you go, its physical design varies depending on what country you live in. 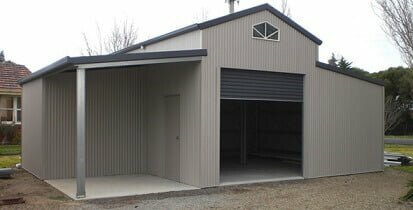 The most common type of barn that you have probably seen is the one we commonly use here in Australia, which is the Aussie barn. It generally has a flat roof with a peak in the middle. If you decide on having one built, we can add many extra features, such as extra doors, skylights, internal walls and added ventilation. The Aussie barn has a simple original template but its ability to contain many extra features is what makes it very practical. The other kind of barn that is very common in the market is the American barn. Although it’s similar with the Aussie barn in style, it is a little bit different in appearance. Unlike Aussie barns which have a single raised point, American barns raise it up in the middle before coming to a point. They also come with a large centre breezeway, which makes them suitable in housing horse floats, caravans and boats. American barns often also include stables inside them, so they may be better suited for people who own horses. Barns are almost a necessity for anyone who owns or operates a farm. There are different types available and it’s up to you which one will fit your needs. Aussie barns are simple but have many possible additional features that make it more versatile. American barns look a little different but also contain useful features. In either case, both barns are effective and will serve their purpose for many years to come because we design any kind with the utmost quality in mind. Call 1300 778 628 for more information about how we can help design yours.